Intersil has announced the ISL29125 digital light sensor, the industry's most accurate, lowest power and smallest Red, Green and Blue (RGB) sensor that optimizes the display resolution and color quality of mobile devices and TVs in all lighting environments. The ISL29125 RGB sensor offers robust on-chip IR filtering technology and market-leading angular response in the industry's smallest form factor to deliver ultra crisp display contrast and consistent brightness across all light sources. The ISL29125 RGB sensor communicates directly with a device's core processor to enable the automatic adjustment of display brightness based on changing light conditions, providing consumers with a more crisp and color consistent experience while extending battery life. The compact ISL29125 is also the industry's smallest 6-lead RGB sensor, which minimizes the real estate requirements of the optical sensor aperture, leading to improved industrial device designs. When moving from one environment to another, lighting conditions invariably change and can affect the clarity and brightness of the device display, sometimes making the display difficult to read and use. With integrated, robust on-chip IR filtering technology and market-leading angular response of a minimum of +/- 35% field of view at 50% light intensity, the ISL29125 RGB sensor eliminates these display fluctuations, whether one is in an incandescent lit classroom, an LED lit store or outdoors in the sun. The ISL29125 works directly with the device's core processor to continuously adjust the lux range and ensure that the display maintains consistent perceived color and the ideal brightness level based on the current lighting environment. The ISL29125 works similarly when integrated into a TV display, effectively adjusting the brightness and color consistency of the display as the lighting conditions in a room changes. Specifically, in organic light-emitting diode (OLED) display TV applications, the ISL29125 can be used to adjust the blue organic material ageing profile to maintain consistent contrast and brightness throughout the life of the display. "Consumers demand a seamless user experience with their handheld devices, whether they are at home, at the office or somewhere in between," said Sandeep Aji, marketing and applications director, Optical Products, Intersil. "Intersil's new digital light sensor solution incorporates industry-leading digital light sensor technology that enables mobile device users to maintain optimal display conditions, especially when moving from one lighting environment to another. The solution provides an excellent example of how Intersil is leveraging our advanced technology to simplify and optimize the consumer user experience, without sacrificing the battery life of mainstream devices." The ISL29125 is the lowest power RGB sensor in the market with a standard I2C interface and an operating voltage range of 2.25V to 3.63V. The ISL29125 also offers a wide dynamic range of 5.7m lux to 10k lux detection capabilities, which allows the display brightness to adjust in low- to high-lit environments, preventing unnecessary power consumption to prolong battery life. The RGB sensor's unique lux range select feature enables designers to program the lux range for optimized counts/lux based on the device's requirements. In power down mode, the RGB sensor consumes less than 0.5uA of current and on active mode it runs at approximately 85uA. 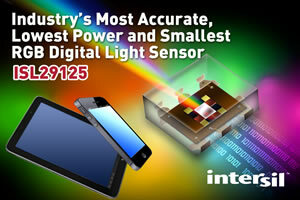 In addition to best-in-class accuracy and power performance, the new ISL29125 is the industry's smallest 6-lead RGB sensor, which greatly minimizes the size of the hole required in device designs to allow sufficient light through for accurate color measurement, thus improving overall industrial design. The ISL29125 RGB sensor can effectively filter out the color of the device when measuring the light color temperature, enabling manufacturers to offer a variety of device color options that consumers crave. The ISL29125 RGB sensor solution is ideal for many other applications in which the highest level of color temperature measurement accuracy is required, including industrial color printers, thermostat displays and water quality testing devices. The ISL29125 is available now in 6-lead optical co-packages. The ISL29125EVAL1Z evaluation board is also available. For more information on the ISL29125 RGB sensor, please visit: http://www.intersil.com/products/ISL29125. For more information on the ISL29125IROZ-EVAL evaluation board, please visit: http://www.intersil.com/en/tools/reference-designs/isl29125eval1z.html.